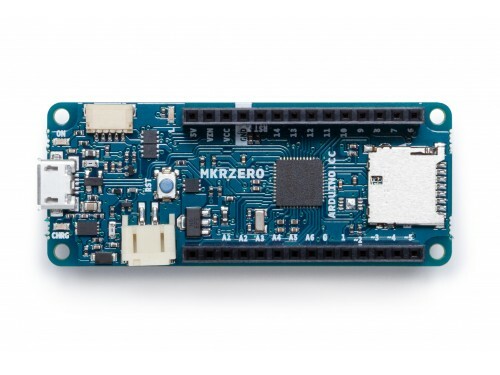 MKR ZERO has an on-board SD connector with dedicated SPI interfaces (SPI1) that allows you to play with MUSIC files with no extra hardware! Arduino Sound library – a simple way to play and analyze audio data using Arduino on SAM D21-based boards. I2S library – to use the I2S protocol on SAMD21-based boards. For those who don’t know, I2S (Inter-IC Sound) is an electrical serial bus interface standard for connecting digital audio devices. You can find here your board warranty informations. 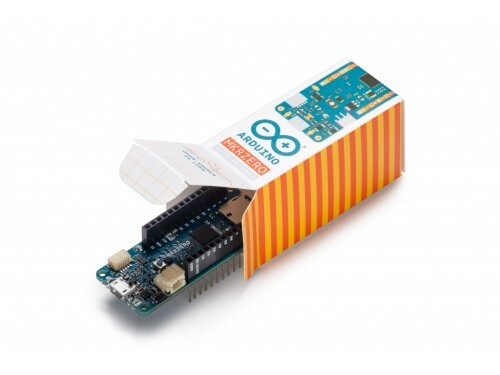 In the Getting Started section, you can find all the information you need to configure your board, use the Arduino Software (IDE), and start to tinker with coding and electronics. The on- board SD connector allows you to play with files without adding any extra hardware to the board. Furthermore SD card is driven by a dedicated SPI interface (SPI1) and so any of the pins of the header is busy during SD usage. 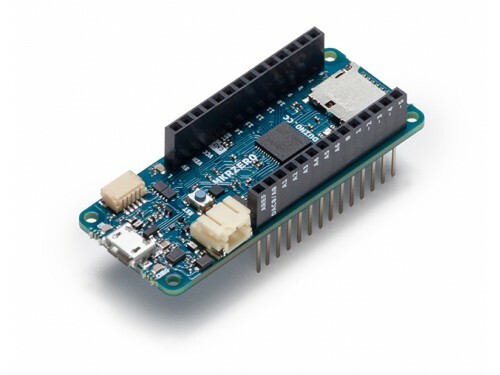 The SD library automatically recognizes the MKR ZERO and so any modification to the sketch is needed to use it aprat from choosing the right SS pin (SDCARD_SS_PIN). Li-Po batteries are charged up to 4,2V with a current that is usually half of the nominal capacity (C/2). 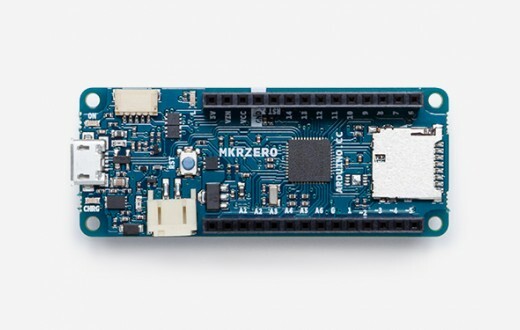 For Arduino MKR ZERO we use a specialized chip that has a preset charging current of 350mAh. This means that the MINIMUM capacity of the Li-Po battery should be 700 mAh. Smaller cells will be damaged by this current and may overheat, develop internal gasses and explode, setting on fire the surroundings. We strongly recommend that you select a Li-Po battery of at least 700mAh capacity. A bigger cell will take more time to charge, but won't be harmed or overheated. The chip is programmed with 4 hours of charging time, then it goes into automatic sleep mode. This will limit the amount of charge to max 1400 mAh per charging round. This pin can be used to power the board with a regulated 5V source. If the power is fed through this pin, the USB power source is disconnected. This is the only way you can supply 5v (range is 5V to maximum 6V) to the board not using USB. This pin is an INPUT. This pin outputs 5V from the the board when powered from the USB connector or from the VIN pin of the board. It is unregulated and the voltage is taken directly from the inputs. As an OUTPUT, it should not be used as an input pin to power the board. This pin outputs 3.3V through the on-board voltage regulator. This voltage is the same regardless the power source used (USB, Vin and Battery). This LED is connected to the 5V input from either USB or VIN. It is not connected to the battery power. This means that it lits up when power is from USB or VIN, but stays off when the board is running on battery power. This maximizes the usage of the energy stored in the battery. It is therefore normal to have the board properly running on battery power without the LED ON being lit. The CHARGE LED on the board is driven by the charger chip that monitors the current drawn by the Li-Po battery while charging. Usually it will lit up when the board gets 5V from VIN or USB and the chip starts charging the Li-Po battery connected to the JST connector. There are several occasions where this LED will start to blink at a frequency of about 2Hz. This flashing is caused by the following conditions maintained for a long time (from 20 to 70 minutes): - No battery is connected to JST connector. - Overdischarged/damaged battery is connected. It can't be recharged. - A fully charged battery is put through another unnecessary charging cycle. This is done disconnecting and reconnecting either VIN or the battery itself while VIN is connected. On MKR ZERO the onboard LED is connected to a dedicated pin (32) and not to 13 as on other boards. It is so suggested to use the LED_BUILTIN define . (*) Note : DO NOT CONNECT to the male JST connector present on the board anything else than a Li-Po battery whose characteristics are compliant with those indicated above. Please DO NOT POWER VIN with more than 5V. 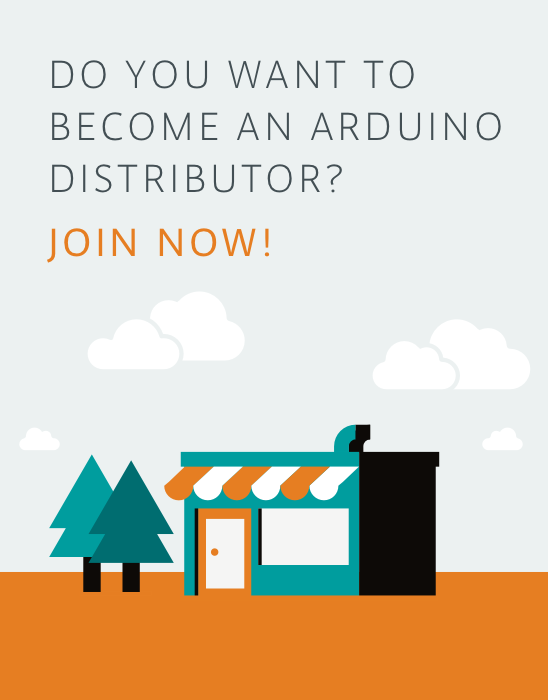 Please check this Generic FAQ and adapt it to the MKR ZERO by deleting informations that don't apply to this board. Q: I plugged the board to my PC / MAC but I cannot see the serial port listed on the IDE, I cannot upload sketch to the board! A: The first thing to try is manually put the CPU into bootloader mode, this is accomplished by pressing quickly twice the reset button (you need a pencil to actually push the button). Another try is to change the USB cable: some micro-USB cables are "power only", you'll see the board powered but no data connection to the PC. A: If still on, remove the conductive foam that protects the pins. A: The LED is connected to a dedicated pin. Use the LED_BUILTIN constant instead of declaring the pin number. Q: What does the CHRG LED blinking indicate? A: Indicates that the board is charging the LiPo battery connected to the white JST connector. Please note that the charger use a constant current of 350mA, this means that you must use a LiPo battery with a minimum capacity of 700mAh otherwise you risk unpleasant side-effects like flames and/or explosions. A: The CHARGE LED on the board is driven by the charger chip. This LED starts to blink at a frequency of about 2Hz (slow blink) if a defective or no battery is connected to the JST connector. Q: I see that A0 is marked as DAC0. There is a DAC on that pin? is usable? A: Yes, there is a DAC and it's usable, you can control the pin with analogWrite(..). Q: Which is the VIN range voltage value? Q: Which is the polarity of the battery? Q: How can I use the on-board SD? A: The on-board is connected to a dedicated SPI interface. The SD library deals with it, so you use the library as usual. Use SD.begin() without specify any pin number, the number will fallback to the right one. Q: What Vin, 5V and VCC means? A: Vin. This pin can be used to power the board with a regulated 5V source. If the power is fed through this pin, the USB power source is disconnected. This is the only way you can supply 5v (range is 5V to maximum 6V) to the board not using USB. This pin is an INPUT. 5V. This pin outputs 5V from the board when powered from the USB connector or from the VIN pin of the board. It is unregulated and the voltage is taken directly from the inputs. When powered from the battery it supplies around 3.7 V. As an OUTPUT, it should not be used as an input pin to power the board. VCC. This pin outputs 3.3V through the onboard voltage regulator. This voltage is the same regardless the power source used (USB, Vin and Battery). Easily control relays with your MKR board! A prototyping shield designed for your MKR board! 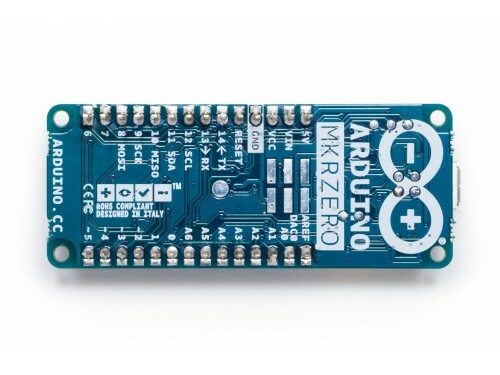 The Arduino MKR 485 shield will provide the industrial connectivity you need. Use Uno shields with your MKR1000 board!